Well, history showed that Miss Warre-Cornish was wrong. They did matter, and not just because they heralded a relaxation of stuffy conventions. But this novel stops short of any of the triumphs to come: Virginia is still trying to get book reviews accepted and does not begin writing her first novel until 1910; Lytton Strachey is unpublished; Leonard Woolf is a civil servant far away in Ceylon; Maynard Keynes is still not sure of what he wants to do; and Vanessa is admiring post-impressionist artworks but is yet to find her own style. And for all her delight in unconventionality, Vanessa is pondering her own unmarried status. At 26, she doesn’t want to risk spinsterhood and she hasn’t found the right man. She feels responsible for Virginia too, likewise unattached at 23. Any potential marriage of these stars of the coterie is also of keen interest to the men (mostly gay or bi) because the suitor must fit in. ‘Postcards’ and ‘letters’ between Lytton and Leonard and others show their anxiety that the brilliant, artistic atmosphere of the Bloomsbury Set should not be sabotaged. Priya Parmar juggles Vanessa’s experience of tragedy and betrayal with her optimism, her pragmatism, and her changing sense of self. The novel shows how trying it can be to live with a sister’s caprice, and how hard it is to vanquish bitterness. But she also shows the impregnable bond between the sisters: Vanessa loves Virginia dearly, and feels responsible for her. She makes decisions to protect herself, but when the crisis comes, she cares for Virginia despite the hurt. Other aspects of the novel still resonate today. Vanessa’s unexpected delight in motherhood is balanced by her discovery that small babies don’t fit in sparkling intellectual circles. Elsie [the nurse] had a toothache so I left her here and took Julian to visit Virginia. It was awful. I held him and rocked him and bounced him, but he still fussed, and Virginia soon adopted a martyred expression. I walked him in slow blunt squares around the room. Virginia said I was making her dizzy. Fortunately Clive called in for me and told Virginia amusing stories that gave her the opportunity to make witty and incisive observations. All this is more or less common knowledge amongst devotees of the Bloomsbury Group, but Parmar brings it alive with a sensibility that is both authentic and contemporary. 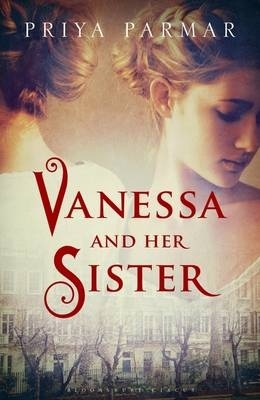 Ignore the ludicrous cover design: trust me, Vanessa and Her Sister is not a soppy historical romance, it’s a wise, thoughtful, sparkling rendition of a life too often subsumed by the profile of others. As you say the cover of the book is awful, it looks like a chick book. I am so glad I read your review, because if I hadn’t I would have steered clear of the book. I trust you, and will look out for it at my library. This type of cover sets my teeth on edge. It tells you everything about cuts to the design budget and all the artistry that went with it, and tells you nothing about the book except that the marketers, who probably haven’t read it, think it’s chick-lit because it’s about women. It does a book like this a terrible disservice: I know this, because I didn’t even open it when it arrived from the publisher. I didn’t read this very thoroughly but when I did pick it up I found it to be a page turner and hard to put down. I think that if an author is writing about real people they should really give the reader notice at the beginning of the book about how much is fact and what is fiction. I still don’t know whether the “pastiche of telegrams and letters” etc exist. I would have enjoyed this book more if the authors note, included after more details about the characters at the end, had been used as a preface. I’m glad you enjoyed it – I found it was a page-turner too (and I wasn’t expecting that). Yes, I think I would have liked to see more detail about her sources, but at the end of the day, I do think that the book works as a story which is the main thing.